Today's post will be reviewing the Nexxus City Shield collection sent to me free for review by Influenster. As always, although I received these products complimentary, my thoughts on the products are 100% my own. There are three hair products within this line: the City Shield Shampoo, Conditioner, and Damage Defense Creme. The premise behind the collection is to rehydrate and revive hair that's exposed to harsh city environments. After living in Boston for four years and continuing to work in the city to this day, my hair has certainly taken a beating. It often looks dull, limp and lifeless and I struggle with flyaways on windy days. I was interested to see if these products live of to their claims of protecting my hair from damage from the urban environments I'm exposed to. For reference, I've been using the shampoo and conditioner daily for about a month now and I use the Damage Defense Cream 2-3 times a week. 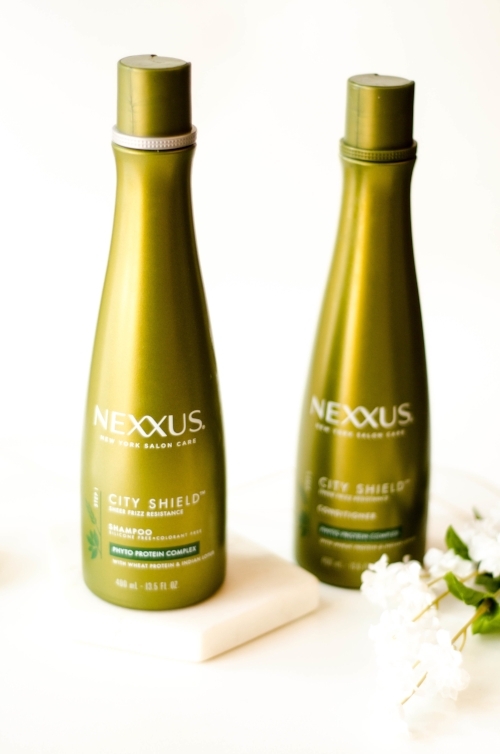 Nexxus City Shield Shampoo: Firstly, this shampoo smells delightful - it's fresh, clean, and light which is perfect for summertime. This can likely be attributed to the lotus extract that is present in the ingredient list. It also lathers up wonderfully and I only need a small amount to cover my long hair. I've found that this shampoo leaves my hair looking much shinier and healthier than it previously was. I don't deal with nearly as much frizz/flyaways on windy days as I once did. My hair is now revitalized and silky smooth, all attributed to the powers of this shampoo! Nexxus City Shield Conditioner: Let me preface this by saying that my hair tangles insanely easily. I also haven't gotten a haircut in far too long, so the split ends tend to tangle up within minutes. With all of that being said, I genuinely look forward to showering at the end of the day because I know that as soon as I use this conditioner, my hair will be tangle-free. I can actually brush my hair when I step out of the shower which is generally unheard of for me. The tangle-free effects also last significantly longer through the day than my hair normally lasts when I'm using other conditioners. Overall, the conditioner works beautifully in concert with the shampoo to leave my hair feeling soft and smooth. 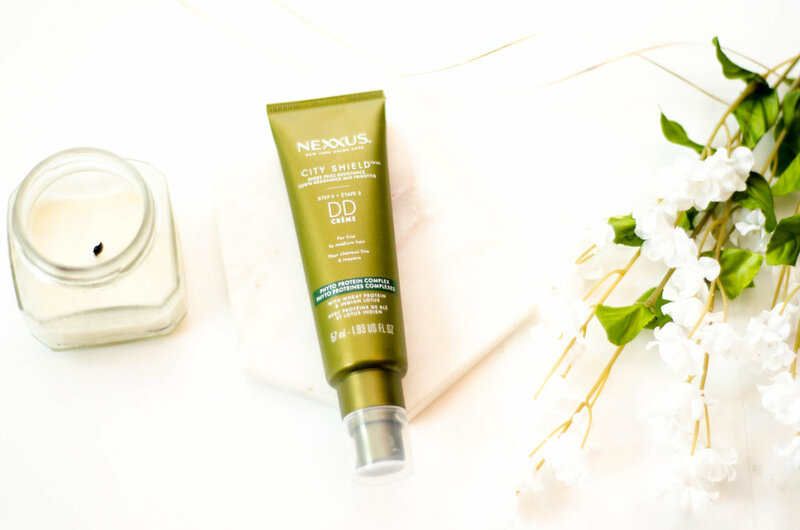 Nexxus City Child Damage Defense Creme: I don't often style my hair, but I've been applying this a few times a week to see the effects it has on flyaways. I've gotta say, I've been really impressed! It completely tames any flyaways I wake up with and prevents any more from forming over the course of the day. What I loved most is it didn't leave my hair either crunchy or oily like some leave-in products tend to. My hair always feels natural after application and doesn't give off the impression that I have any product in it. The DD creme leaves my hair feeling silky throughout the day, making it the final product in the trifecta for smoother hair. Overall, I have nothing but positive thoughts on the Nexxus City Shield collection! I honestly was not expecting much from these products but they certainly far exceeded my expectations. My hair is happier and healthier, and I would absolutely repurchase every one of these products in the future! Have you tried anything from the Nexxus City Shield collection? What are your thoughts? Leave a comment below!